An increasing number of BB Leaders are contacting BB Headquarters with concerns and questions about how best to support a young person who is self-harming. It is clearly something that we are becoming more aware of and with the right understanding; BB Leaders are uniquely placed to help young people through this distressing time in their lives. More than a third (36%) of 16-25 year-olds in Britain have self-harmed at some point in their lives, according to a new survey. The survey defined self-harm as “when someone intentionally damages or injures their body”. Although we often think of self-harming as cutting or burning it can be anything which causes injury or damage. Remember, self-harm isn’t a suicide attempt or a cry for attention. However, it can be a way for some people to cope with overwhelming and distressing thoughts or feelings. Self-harm should be taken seriously, whatever the reason behind it. 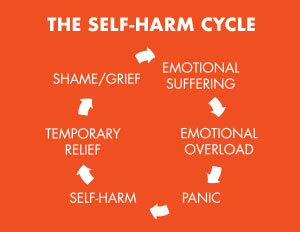 Self-harm usually starts as a way to relieve the build-up of pressure from distressing thoughts and feelings. This might give temporary relief from the emotional pain the person is feeling. It’s important to know that this relief is only temporary because the underlying reasons still remain. Soon after, feelings of guilt and shame might follow, which can continue the cycle. 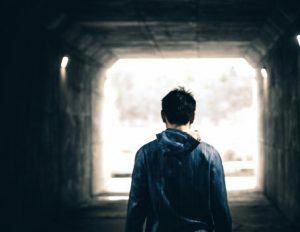 Why might a young person self-harm? Everyone has different things that cause stress and worry to them. Some people can manage these troubles by talking to friends and family, while others may find these difficulties overwhelming. When we don’t express our emotions and talk about the things that make us distressed, angry or upset, the pressure can build up and become unbearable. Some people turn this in on themselves and use their bodies as a way to express the thoughts and feelings they can’t say aloud. People often harm themselves when this all gets too much. If a young person self-harms, they might find that when they feel angry, distressed, worried or depressed, they feel the urge to hurt themselves even more. When a few of these issues come together they can quickly feel overwhelming and become too much for one person to deal with. As one young person said, many people self-harm to ”get out the hurt, anger and pain” caused by pressures in their lives. They hurt themselves because they didn’t know what else to do and didn’t feel like they had any other options. How can a BB Leader help? Learning that someone you know is self-harming can be difficult, and can make you feel upset, confused or even angry. Don’t panic if you’re not sure how to react – often simply being there is enough. Ask if their parents or carers are aware and encourage them to confide in a trusted adult within the family or at school. If you are worried or unsure what to do, you can phone Karen Jay, the Director of Youth and Children’s Work at BB Headquarters. Allow the other person to speak without interruption or judgement. For them self-harm may feel like the only way to express very strong and deep-rooted emotions. If someone feels able to open up to you this can be a huge breakthrough, so try not to jump to conclusions or make any fast decisions. Take the initiative and find out about mental health and other support services in the area. There are some useful websites listed at the end of this article. Don’t expect a quick fix – some people self-harm for years as a way of dealing with difficult emotions or situations. Most people don’t want to be defined by their self-harm, so keep on being there as their BB Leader as normal too. It can be worrying and overwhelming when first faced with the issue of a young person self-harming. Don’t over-step the good youth work boundaries and become too involved, or act alone – talk to your Chaplain, Captain or Church Safeguarding person, or you can talk to Karen Jay at BBHQ. You might want to consider having a discussion with Company staff so that everyone understands the basics from this article. If you feel confident to do so, you could schedule a programme activity for Company or Senior Sections. You can find resources and support from organisations including Young Minds. You can show this video: http://mindreel.org.uk/video/self-harm-animated-film-young-people and then perhaps have a discussion with your young people. Make it clear who they can talk to if they are worried about themselves or a friend. Offers a free confidential online service reaching roughly 200,000 young people per year who are suffering with self-harm. Available to offer recovery support and advice to those struggling with self-harm and be there in times of crisis. The Mix is a free, confidential information and support service for under 25s, helping over 2 million young people in the UK each year. YoungMinds is the UK’s leading children’s mental health charity committed to improving the mental health and emotional well-being of children and empowering their parents and carers.